The third phase of the U16 FIBA European European Championship is all about winners taking all. The first six days of the competition, coaches and players were testing out plays and getting players ready for the knock-out phase. The Netherlands were the surprise package of this tournament. But the Russians were ready for them. They allowed Kourtney Treffers (right) to score some times. Yet they restricted the rest of the team to 35 points as they ran out winners (80-58) by scoring 62 of their points in the paint. Croatia had to work hard in getting past Belgium. Ana-Marija Begic's back to back scores with five minutes to play set up Croatia for the final victory (58-51). Turkey had a day to forget from the free-throw line in their defeat against Serbia with just 6-from-20. Serbia had to wait until 40 seconds to play to put themselves in charge for good. Natasa Kovacevic hit a three-pointer just as the 24-second shot violation buzzer went off. Serbia went on to win (54-49) and play Croatia in the semi-final. Spain will miss out on a medal for the first time since 2003 after losing to France (57-60) in the last quarter-final match. Olivia Epoupa fired in 21 points and dished out 5 assists to help France qualify for their fourth consecutive semi-final. France meet Russia for a place in the final. Lithuania have been relegated from Division A after falling to Belarus. Russia did not take any chances in this game. Their coach Elena Shulzhenko called a time-out with just five minutes played with the score tied (5-5). Russia stepped on the accelerator in a 15-7 run and appeared to be cruising. However the Dutch team fought back with Kourtney Treffers to score the last 7 points of the first quarter (19-20). Russia went to work inside the paint during the second quarter while the Netherlands stayed in the game with clutch perimeter shooting. Russians went into the locker room ahead (39-32). But it was the Dutch who came out firing on all cylinders and reduced the deficit to a single point (41-42) with 22 minutes on the game clock. This was as close as the Netherlands got to upsetting Russia. Russia won the rebound battle and were too strong for the Netherlands in the paint and outscored their opponents 20-5 for the rest of the quarter to lead (62-46). Russia controlled the pace of the game and put an end to "Oranje Fever" for this edition. Alexandra Marchenkova (above) led the way for Russia with 19 points and 10 rebounds. Treffers finished with her 6th double-double of the competition with 22 points and 13 rebounds. Croatia did most of their work inside the paint in holding off Belgium (58-51). Belgium scored 33 points from beyond the arc with 11 treys. But they were unable to get into the paint and just managed 4 points under the basket. Croatia on the other hand did all their work close to the basket. They scored 36 points under the basket and hit just 1 shot from beyond the arc. For Croatia Andrijana Cvitkovic (left) led the way with 17 points while Iva Cigic contributed 11 points. For Belgium Camille Lebrun led the way with 20 points of which she hit 6-of-10 from beyond the arc. Belgium had the better start to the game and hit 4 treys during the first quarter to lead (14-12). Croatia's superior play inside enabled them to go 9 points clear (26-17) with five minutes left till the interval. Lebrun fired in a couple of treys as Belgium reduced the deficit at the interval to 5 points (25-30). The start of the third quarter was tough on both sides as they were unable to get into an offensive rhythm. Cigic from Croatia finally found her way to the basket with 7 points as her team went 10 points clear. Belgium finished the quarter with a couple of three-pointers (39-41) and regained the lead with another trey from Lebrun (47-45) with just under eight minutes to play. Croatia changed defensive systems and did not allow Belgium any room for three-point shots while Ana-Marija Begi and Cigic went to work in getting the advantage back (51-49) with four minutes to play. Cvitkovic did the rest of the scoring for Croatia, mainly from the free-throw line in a scrappy finish. Turkey came into the match on the back of five victories and appeared to have everything under control leading (19-12) by the end of the first quarter. Turkey continued to control the match despite not scoring during a defensive error-prone second quarter to go further ahead (28-19) at the interval. After the break Natasa Kovacevic (right) from Serbia took over leading her team as they went in front briefly (35-32). A three-pointer by Didem Nakas was enough for Turkey to sneak back in front going into the final quarter (38-35). The last 10 minutes were a ding-dong affair with the game going back and fourth with the lead changing hands several times. The teams were level (47-47) with the game in money-time. With 20 seconds left to play they were again level (49-49) until a three-pointer by Kovacevic sealed the victory for Serbia. Since the creation of Division A at U16 level in 2004, Spain had always qualified for the final, winning the title on five occasions. Their only loss in a final came in 2007, when they were beaten by France (57-60), the same score as this quarter-final match. Olivia Epoupa (right) from France and Elena De Alfredo from Spain led their teams in what can only be described as a FIBA Europe U16 classic. Epoupa dished out 5 assists, took 8 rebounds and scored 21 points while De Alfredo scored 19 points for Spain. The first quarter went back and forth with the lead changing hands on every possession. 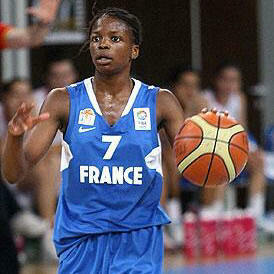 France managed to edge the quarter with free throws from Epoupa and Valériane Ayayi (21-15). Spain reduced the deficit during the second quarter with their inside play (29-30). The third quarter was intense with both teams having their moments with France holding onto the advantage (49-47). France stayed in front all the way and with 42 seconds left to play they appeared to have the game won (60-54). Evaristo Pérez the head coach from Spain called his second time-out of the quarter with about 36 seconds left to play. He explained carefully what he wanted and six seconds later Laura Aliaga fired in a trey for Spain. France were then under pressure and when Axelle Koundouno's shot failed to drop Spain had a chance to take the game into overtime with the very last shot of the game. However Irene Gari's buzzer beater three-point attempt failed to drop and Spain were out.